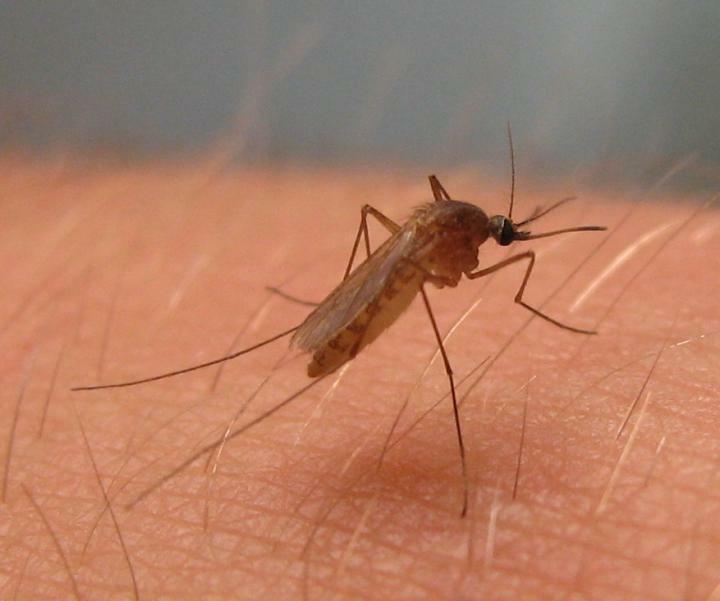 Culex pipiens is among the mosquito species that are important in transmitting West Nile virus in North America. The study, published February 8 in Proceedings of the Royal Society B, involved researchers from UC Santa Cruz, Stanford University, and the New York State Department of Health. They analyzed 15 years of data on human West Nile virus infections from across the United States and found that epidemics were much larger in drought years and in regions that had not suffered large epidemics in the past. “We found that drought was the dominant weather variable correlated with the size of West Nile virus epidemics,” said first author Sara Paull, who led the study as a post-doctoral researcher at UC Santa Cruz and is now at the National Center for Atmospheric Research. West Nile virus was introduced into North America in 1999 and has caused yearly epidemics each summer since. The intensity of these epidemics, however, has varied enormously. In some years, there were only a few hundred severe human cases nationally, whereas in each of three years (2002, 2003, and 2012), approximately 3,000 people suffered brain-damaging meningitis or encephalitis, and almost 300 died. The variation at the state level has been even higher, with yearly case numbers varying 50-fold from year to year, on average. The causes of this enormous variation were unknown and had led scientists at the Centers for Disease Control and Prevention to suggest that predicting the size of future epidemics was difficult or impossible. In the new study, Paull and Marm Kilpatrick, an associate professor of ecology and evolutionary biology at UC Santa Cruz, analyzed patterns in the number of severe West Nile virus infections each year in each state and nationally. They examined a number of weather variables, including summer temperature, precipitation, winter severity, and drought. They also tested a long-standing hypothesis that the disease shows a wave-like pattern in causing large outbreaks in the first year and few cases subsequently due to a build-up of immunity in bird populations, which are the main hosts for the virus. Kilpatrick said the links with drought were unexpected. In collaboration with Dr. Laura Kramer from the New York State Department of Health, his lab had developed a very careful method of mapping the influence of temperature on the biology of both the virus and the three different mosquitoes that are most important in transmitting the virus. It’s not yet clear how drought increases transmission of the virus, he said. Data from Colorado indicate that drought increases the fraction mosquitoes infected with West Nile virus, but not the abundance of mosquitoes. Drought might affect transmission between mosquitoes and birds by stressing birds or changing where they congregate. With the help of climatologists Dan Horton and Noah Diffenbaugh at Stanford University, Paull used the links between drought, immunity, and West Nile virus to project the impacts of climate change on future epidemics. Over the next three decades, drought is projected to increase in many regions across the United States due to increased temperatures, despite increases in precipitation in some of the same areas. Model projections indicated that increased drought could double the size of future West Nile virus epidemics, but that outbreaks would be limited to regions that have yet to sustain large numbers of cases. These findings provide a tool to help guide public health efforts to regions most likely to experience future epidemics.